Masonic Jewelry is worn by members of the craft to exemplify the feelings of universal brotherhood which Freemasonry both teaches and embraces across the world. Many new members of the fraternity see other brothers wearing Masonic jewelry such as Masonic recognition pins, Masonic rings, Masonic cufflinks, a Masonic pocket watch and other variations of Freemason jewelry and wonder what the different Masonic symbols on it, mean. Q: Is there any requirement to wear Freemason jewelry within the craft? A: No. There is not. Q: Do Lodges provide jewelry to their members? A: No. As a rule, each brother chooses and purchases his own according to his own taste and his budget. Some lodges, however, do order custom lapel pins with their lodge name and number on them for their members. Q: Why do Freemasons wear Masonic craft-related jewelry? A: The reason is because they not only enjoy the camaraderie of being part of the fraternity, but are proud of its long history, honorable reputation and charitable causes. Each appendant body within Freemasonry has their own symbolic jewelry representing their specific affiliation. Within craft lodge Freemasonry, there are 3 degrees, Entered Apprentice, Fellowcraft and Master Mason. 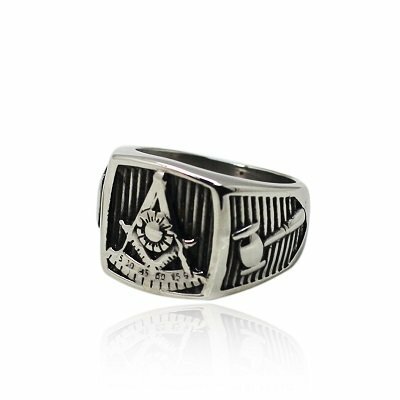 Once a man becomes a Master Mason, he may choose to purchase a Master Mason ring from a reputable jeweler. Craft lodge jewelry often displays the square and compasses symbol, however Masonic lapel pins display a vast array of Masonic symbols, such as the Masonic trowel, Euclid's 47th Proposition pin, officer pins with their officer jewels upon them, the Masonic apron and many, many others. Most (not all) Past Masters wear Past Master pins, and/or Past Master rings signifying their having held the rank of Worshipful Master of their lodge. Past Master jewelry is always in high demand and nice, vintage or antique pieces, especially those made with 10 karat gold or higher, sell quickly. Members of Freemasonry's many appendant bodies such as Scottish Rite, York Rite, DeMolay, Shrine and others proudly display their affiliations by wearing Masonic lapel pins, Masonic watches, rings, pendants and keychains which signify the degrees they have passed and the ranks and titles they have attained within the fraternity. Scottish Rite: After becoming a Master Mason, some Freemasons choose to join the Scottish Rite, one of the appendant bodies. After passing the 32nd degree of the Scottish Rite, (Ancient and Accepted Scottish Rite of Freemasonry), members typically wear Scottish Rite rings which display the double-headed eagle and/or Yod. York Rite/Knights Templar: After becoming a Master Mason, some Freemasons choose to join the York Rite, one of the appendant bodies. Upon becoming a Knights Templar, members may wear Knights Templar rings. In some countries, Knights Templar is part of the York Rite. In others, it is a separate order which stands on its own. DeMolay: Members of the Order of DeMolay, is a Masonic youth group for boys between the ages of 12 and 21, which was founded in 1919 in Kansas City, Missouri by Frank S. Land, a Freemason. Members of DeMolay wear DeMolay pins and other DeMolay jewelry. Rainbow Girls: The International Order of the Rainbow for Girls, founded in 1922 as a Masonic youth group for girls between the ages of 11 and 21, wear Rainbow Girls pins, pendants and earrings. 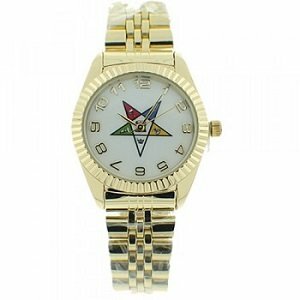 Eastern Star: The Order of the Eastern Star, O.E.S., was created by Dr. Rob Morris, a Boston lawyer, in 1850. In 1866, Dr. Morris turned the work over to Robert Macoy, who went on to establish its chapters and ritual. Eastern Star members are both men and women who have a Master Mason within their immediate family. They wear Eastern Star jewelry such as earrings, pendants and Eastern Star rings or lapel or breast pins representing the title they have attained (past or present) within the O.E.S. organization. Shrine Jewelry: The Ancient Order of the Nobles of the Mystic Shrine, commonly called Shriners, was established in 1870 in the United States by Dr. Walter M. Fleming, M.D. and William J. Florence. Shriners wear fez pins, shriner rings and shrine pins. 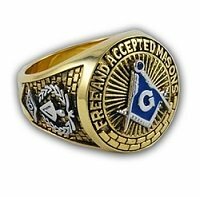 Since in most jurisdictions it is a requirement of membership within Shrine that the man first be a Master Mason, it is also quite common to see a Shriner with a Shrine ring on one hand and his Master Mason ring on the other. "A.A.O.N.M.S. stands for The Ancient Arabic Order of the Nobles of the Mystic Shrine. A.A.O.N.M.S. is an anagram for "A MASON". The Shrine is a uniquely American organization. To Freemasons in other parts of the world, Shrine membership is not available. The "Shrine Temple", the building in which Shriners meet, is dedicated to deity. Members of the Shrine are called "Nobles". Their wives are called "Ladies", e.g. : Noble John Jones and his Lady Samantha. Shriners are the social "arm" within Freemasonry. This organization hosts balls, golf tournaments, ice cream socials and other events. Nobles wear fezzes and you will often see them in parades or volunteering for the many charitable causes both local and national that the Shrine supports. Shriners are well known for their tireless charitable support of burn victims. They fully fund and support several burn hospitals for children where burn patients under the age of 18 are treated at no charge. There are many more appendant bodies within Freemasonry than are listed above. Each have their own symbolic emblems upon their Masonic jewelry. To see the antique Masonic jewelry photos which people have sent in, click on the links, below. Will Purchasing Masonic Jewelry Bring Me Luck?